The airport has always existed as a transitional space - a portal between experiences that encourages us to carve out an ephemeral alternate reality while in transit. 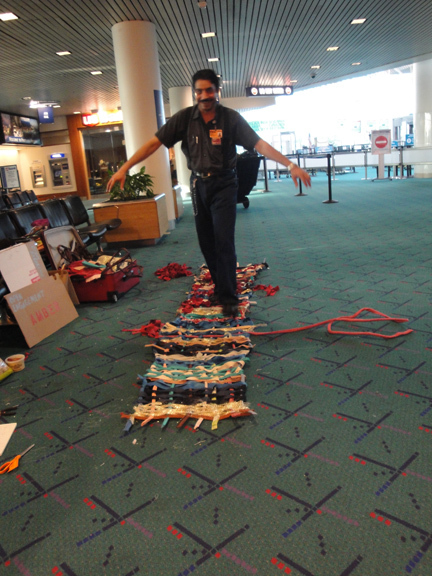 Woven Welcome began here at the Portland International Airport in 2012. 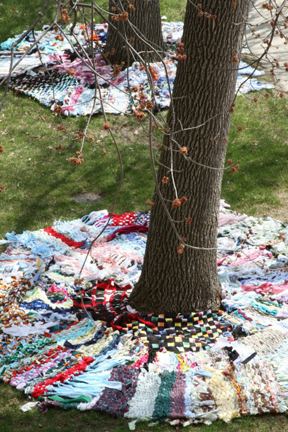 When Jill Odegaard, Sandy Sampson and Anne Greenwood decided to weave a welcome mat. The impulse came first from wanting to fill our time in some appropriate fashion, as we would be meeting people coming to the Portland State University: Art and Social Practices Open Engagement conference. Over a period of many hours with many gaps between arrivals, we knew immediately that we wanted to ask for help from others at the airport no matter what we did, and a welcome mat surfaced quite quickly. In this multiphased project we have created various manifestations of our loosely held concept to engage with individuals in conversation while weaving on simple looms to make colorful rag rugs, creating a collaborative public work. The conversations take on a particular focus given the nature of the site and community. We work together at coffee shops, churches, schools, community centers, public facilities, etc., in active collaboration setting up the looms, making design decisions, attaching the warp, and then weaving in the weft using repurposed fabrics; at times focusing conversation on the potential of working with cast-off materials to make these vibrant, hand-woven mats while using weaving as metaphor connecting, blending community, and focusing on sustainability. 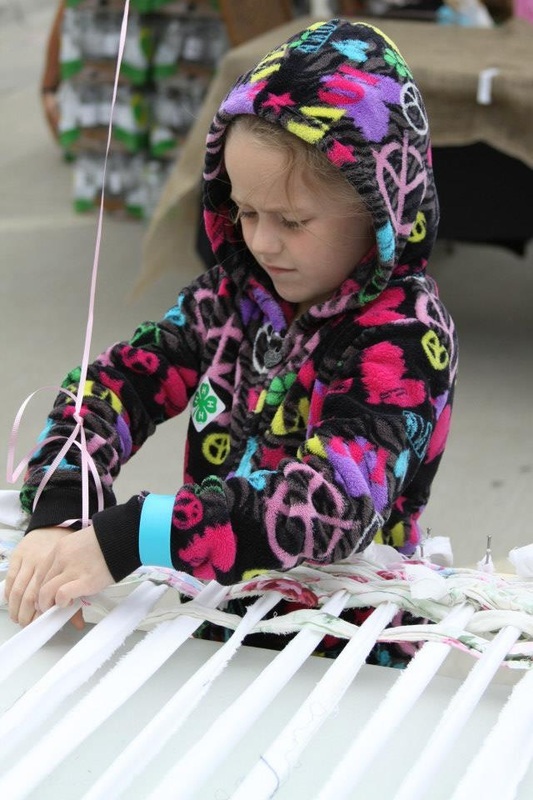 Jill Odegaard has led community engagements in both Park Rapid, MN for the Governor's Fishing Opener in 2013 and Creative Time:Living as Form at the Plains Art Museum in Fargo, ND in 2014. 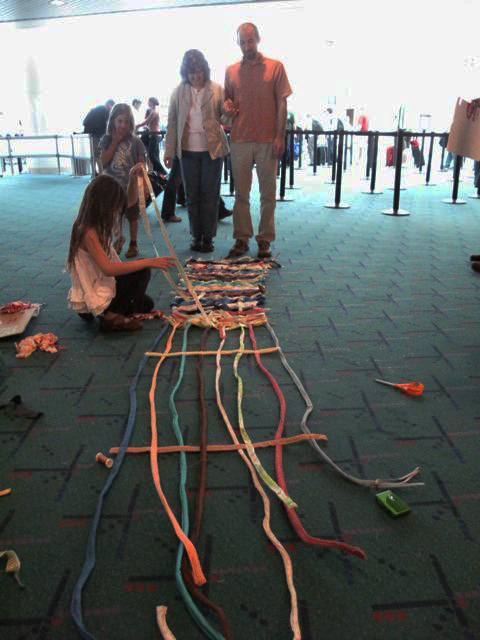 Anne Greenwood has been working with the looms in classrooms, using the project as an opportunity for students to collaborate in a community art project in Portland, OR.